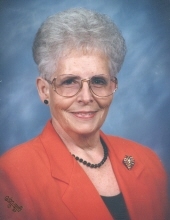 Blanche Marie Davis, 84, went to be with her Lord on January 27, 2019 in Tomball, Texas. She was born to parents Herman and Samantha V. Wilson on August 29, 1934 in Delight, Arkansas. Blanche was the secretary of North Side Baptist Church for many years, where she was a long-time member. She married her loving husband, Billy Joe Davis, Sr. in 1954, and were married for 59 years, before his passing in 2013. She is preceded in death by her parents, husband, and son, Billy Joe Davis, Jr. She is survived by her children, Christina German, Rebecca Russell and husband Arlis Jr., Patrick Davis; sister, Virginia Adams; grandchildren, Johnnie C. German, Laura Neel, Arlis Russell III, Richard and wife Emily Russell, Stewart Russell, Clint Davis; great-grandchildren, Rickey Neel, Elaina Neel, Emma Hudson, Benton Russell, as well as numerous nieces, nephews, extended family members and friends. Graveside services will take place at 12:00 P.M. on January 30, 2019 at Brookside Memorial Park Cemetery, officiated by Pastor Jaime Garcia, under the direction of Carter-Conley Funeral Home. To send flowers or a remembrance gift to the family of Blanche M. Davis, please visit our Tribute Store. 13401 Eastex Freeway Highway 59 @ Lauder Rd. "Email Address" would like to share the life celebration of Blanche M. Davis. Click on the "link" to go to share a favorite memory or leave a condolence message for the family.